Without doubt, the most clear area in a person’s life that one can benefit from minimalism is in their place of residence; their home. By reducing our living space we can save vast amounts of time and money. For starters, the bigger the space we live in, the longer it takes to maintain that space; it’s as simple as that. In all likelihood there are spaces in our homes where we vacuum, that we seldom ever set foot otherwise. Imagine how much less time it would take to clean our home if we just cleaned the areas that we use regularly. Next, It’s costly having so much space. Obviously it is far more expensive to purchase a larger home than a smaller one, but let us not forget that this is not the only expense we have that depends on the size of our dwelling. Land and school tax, and utilities (electricity, heating, cooling) are all drastically reduced when we downsize our home. Storage Spaces (closets, attics and basements) – Some of this space is used for our wardrobe, linens, toiletries, tools, and other necessary valuable items. But we must also be honest with ourselves as far as how much of this stuff is clutter. If we need a “cut and dry” rule about storage spaces then use this: Short term storage is good (linen closet, medicine cabinet, wardrobe), long-term storage is bad (attic, basement, “walk in” closet). Kitchen – absolutely necessary for survival. Bedroom – Privacy and sleep, absolutely necessary. Dining Room – Unless we frequently have dinner guests over, I do not see the necessity here. This is usually just another mostly unnecessary, and frequently unused room in a home. Meals can be had in the kitchen or living room. Living Room – The meeting and gathering place. Absolutely necessary. Not in the “hunter and gatherer” sense of the word, but certainly a valuable room for social interaction. Family Room – Didn’t I just mention the living room? …….wait. Aren’t these the same thing? These two rooms certainly serve the same purpose. The only difference is one has a TV and the other doesn’t. I suggest we move the TV to the living room, take down the family room, and save ourselves cleaning time and tax payments (not literally). Office – With little exception (running a business out of our home), this room is completely unnecessary. In this digital age, we can set up our laptop computer in any room of the home. The idea of having a separate room just so we can pay bills, study, read, and/or do life/financial planning is just ridiculous and mildly egotistical. Garage – If we have a passion for vehicle repair/creation/maintenance then this may be a necessary room. Or, if we are sportsmen and keep our kayak, camping, and climbing gear in the garage. If not, then this is a waste. Sheltering our vehicle is not going to extend the life of it long enough for it to be worth the extra time and money spent to have this room. Having a cute little home for our BMW is just egotistical. Laundry Room – Valuable …… but doesn’t really need to be a separate room now does it? Instead lets throw the washer and dryer in the garage to finally give the garage some value. Guest Room – Do we have guests over frequently? Lots of them at once? Maybe this is valuable if so. But if this occurs 1-6 times a year and only one (or one couple) at a time, a sofa-bed in the family room should suffice. Duplicates of the rooms already mentioned – Depends mostly on how many people reside in the home. But let’s be honest with ourselves, a married couple with no children doesn’t need 2.5 baths. The Yard – Do we have lots of barbecues, volleyball games, or yard parties? If so, then having a yard is an invaluable asset that is crucial to our lifestyle. But if we don’t, and the amount of time spent maintaining it (mow, rake, and grounds keeping) outweighs the time spent enjoying it, it is a drain on our life. Note: Often times many of these rooms can be combined. Example: A single person can have everything they need in a studio apartment if their futon turns their living room into a bed room, and then back again. 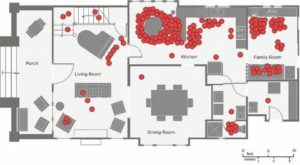 A report by the UCLA-affiliated social scientists reveals in their study after following and recording the behaviors of 32 LA families in their homes, that on average people use only 40% of their home space on a regular basis. This report is called Life at Home in the Twenty-First Century: 32 Families Open Their Doors. Previous PostPrevious Come meet me in person at HV Horrorcon!